Today’s Koala class was a lot of fun. Since Showa Day was on Tuesday this week, we hadn’t been able to meet for a week. We were so happy to see everyone back in class. 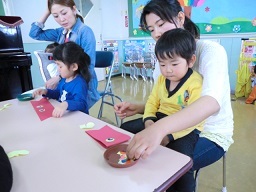 We did a craft for Children’s Day. 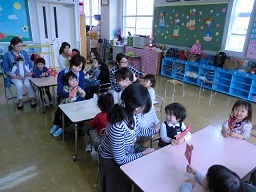 The children made carp flags or streamers for the occasion. 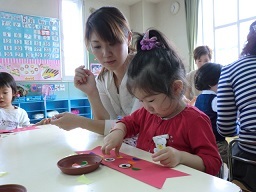 Moms helped some but the children were able to do much of the craft themselves. After that, we sang a song to go with our craft. It was a lot of fun and we look forward to seeing everyone back here after Golden Week!